Although the first DC circuit breaker concept was proposed in the 1970’s (using gas-discharge tubes at that time), it took around 40 years before the first economical, thus acceptable concept for a commercial use in a HVDC system was developed: the ‘hybrid’ DC circuit breaker. Laboratory tested in 2013, it offered – at last – sufficiently low losses to be economic in a commercial HVDC system (see the 2014 paper). “However, the commercial uptake of such hybrid breakers has been slow, mainly because of their relatively large cost, complexity and footprint” explains Colin C. Davidson, from GE’s Grid Solutions Business. “New developments using optimized gas-discharge tubes could completely change this picture”. Grid operators increasingly use high Voltage Direct Current (HVDC) to carry high power over long distances, as direct current (DC) is superior to alternating current (AC) because it can transmit power without capacitive or inductive losses. The first HVDC schemes indeed used mercury-arc valves, a type of gas-discharge tube for the conversion between AC and DC; these mercury-arc valves allowed to construct single switches offering voltage ratings of hundreds of kilovolts, a long operating life and a high robustness to faults. Afterwards, due to their high maintenance requirements, these mercury-arc valves were replaced by semi-conductor devices such as thyristors (for Line-Commutated Converter HVDC) and, later, IGBTs (for Voltage-Sourced Converter HVDC). Semiconductor devices were also proposed for all published variants of the ‘hybrid’ DC breaker concept until 2017. Hybrid DC circuit breakers are built (see figure 1) with a mechanical switch (ultra-fast disconnector), low- and high-voltage semiconductor switches (PE1 and PE2) and a surge arrester which provides the reverse electro-magnetic force (EMF) needed to drive the fault current to zero, absorbing the inductive stored energy in doing so. However, the component count in these hybrid concepts is very high (and expensive), due to the hundreds of semiconductor devices needed to withstand such high voltages. So “the advent of a single high-voltage switch capable of withstanding the entire terminal-to-terminal voltage of the DC breaker could be transformative” points C.C. Davidson. Rather than searching for 100 % innovative concepts, why not look back for the future? The difficulty of the complete operation can be illustrated by comparing it to the successful catching, in a ‘blink of an eye’, of a 1-ton mass falling from a 450 m height. As a matter of fact, GE was one of the pioneers of HVDC starting with mercury arc valves, a type of gas-discharge tube, more than 50 years ago. The advantage of this technology was that the mercury cathode, being liquid, was self-restoring. This gave the valve a longer operating life than any gas discharge tubes using solid cathodes (such as thyratrons), and a robustness to faults that cannot be emulated by semiconductor-based switches. The company and its predecessors built both the first commercial thyristor-based HVDC scheme (Eel River, in 1972) and the last commercial mercury arc scheme rated at 150 kV dc and 1800 A, the largest such valves ever, both in Canada. So, what if there would be a chance to obtain the same advantage without the inconvenience? “Experts of GE’s Global Research Center (GRC) thought that some old electrical concepts sometimes judged obsolete, could be given new life by steady improvements over the years in materials, components, processing, controls, and software, as it occurred in high power RF applications (microwave ovens, radio and TV transmission, radars) as well as in X-ray medical imaging” Davidson explains. This is all the truer since a new generation of gas-discharge tubes appeared, offering a much more compact solution than thyristor or mercury-arc based valves and – crucially – the ability to turn on but also to turn off current. An ideal first application for such a gas-discharge tube could be HVDC, to replace the complex and bulky high-voltage semiconductor system of the hybrid DC circuit breaker by a single gas-discharge tube. Potential advantages are obvious. Single tubes can stand off and switch high voltages and for example, x-ray tubes operating at 600 kV can be purchased off-the-shelf. Tubes can carry potentially large currents, essentially in proportion to their active cross-sectional area, and they can switch quickly (the order of a microsecond), similar to thyristors. GRC selected gas-plasma tubes over vacuum tubes based on their lower forward voltage drop during operation. While HVDC converters were identified as a particular application for such tubes, they could particularly well function in frame of the DC breaker topology. With this in mind, GRC recently decided to launch a long-range project to investigate such tubes. Several objectives have already been accomplished. Tube prototypes constructed at 40, 100, and 300 kV, provided knowledge of the necessary materials, engineering, and construction methods. And unlike their mercury-arc predecessors, which required a long anode column with sophisticated grading electrodes to withstand high voltages, this new generation of tubes (Figure 2) is “remarkably compact, much smaller than traditional mercury arc or present-day thyristor valves”. 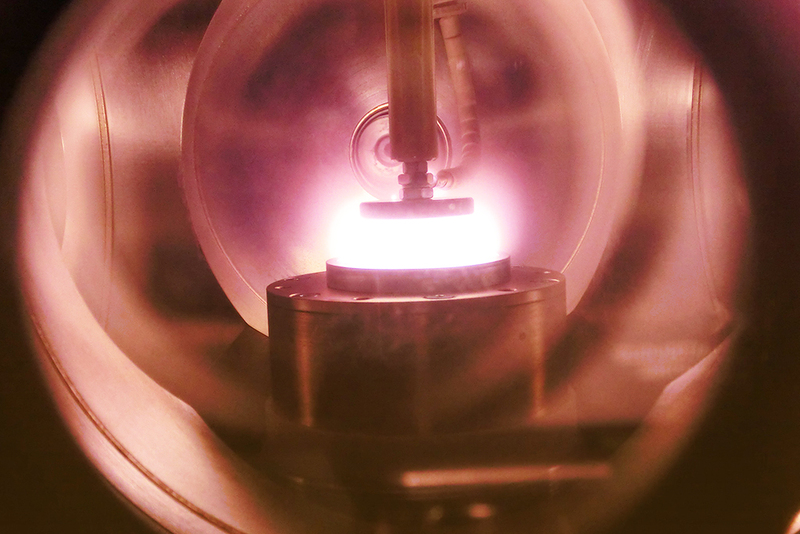 Various tests and a close examination of the plasma within the tubes during operation has revealed new, unexpected operational plasma states, some of which have lower forward voltage drops than previously expected, which can pay benefits in various applications. In HVDC hybrid breakers, Figure 1, the idea would be to substitute the auxiliary branch components (PE2) for a Gas Discharge Tube, keeping the main branch components (PE1 and the ultra-fast disconnector) essentially unchanged. “Moreover, since the DC circuit breaker operates infrequently, the operating life of the cathode material is not a concern, and the resulting DC circuit breaker could be much more compact than today’s solution, in a way that an outdoor, containerized, factory-tested solution could become feasible” reveals Davidson. Let’s take a ±320 kV VSC HVDC scheme with one breaker at each pole as an example. As the Transient Interruption Voltage (TIV) for a DC breaker—i.e. the peak voltage that the DC breaker should produce in order to force the current down to zero— is typically 150 percent of the nominal DC voltage, the breaker would require a TIV of 480 kV. This is fully achievable with a single gas discharge tube resulting in a very compact system. However, it is possible to divide the circuit breaker in smaller stages and to use it as current limiter. By using smaller stages as necessary for current interruption, the DC breaker can prevent the further rise of current due to remote (out of zone) faults, leaving the duty of interrupting the fault current to another DC breaker, further upstream. simplification of mechanical configuration: the modular construction could simplify the mechanical configuration of the DC breaker and its housing. Coming back to our example, the base of the 320-kV breaker’s structure are four identical modular sub-breakers, each of them with a nominal DC voltage of 80 kV and a Transient Interruption Voltage of 120 kV. One major limit of the commercial uptake of classic hybrid CBs is the (perceived) need for them to be located inside a large climate-controlled building similar to a valve hall, which precludes the possibility for DC breakers to be added as a retrofit on existing point-to-point HVDC schemes due to the lack of space. Normally, HVDC converters are housed in special climate-controlled buildings because the high DC operating voltages cause particulate pollution to adhere to the insulating surfaces of the converter. In the case of a DC breaker, all components are normally operating at the same electrical potential – that of the DC line in which the breaker is inserted. It is therefore appropriate to enclose the DC breaker components in a conductive housing that is at DC line potential. The DC breaker components are therefore inside an equi-potential housing (in normal operation), and there is no tendency for these components to attract any atmospheric pollution. The enclosure therefore does not need onerous requirements for filtration or air-tightness. As a result, a two sub-breaker scheme is obtained, each breaker rated at 80 kV nominal voltage (120 kV TIV) installed inside a midpoint-connected typical ISO 668 shipping container. The DC breaker components only see a transient voltage of up to 120 kV with respect to the container. As the air clearances at such a voltage are modest, it leaves enough room inside the container for the DC breaker equipment itself. To make a complete 320 kV DC breaker, two such units are connected in series, each unit being mounted on an insulated pedestal (Figure 4). The DC breaker components are factory-assembled, tested and shipped to site inside the containers, with only the wall bushings, corona rings and support insulators being added on site. Figure 3: A modular DC breaker unit consisting of two sub-breakers, each rated at 80 kV nominal voltage (120 kV TIV) inside a midpoint-connected container. “Avoiding the need of a large climate-controlled building to house the breaker, just using a typical ISO 668 outdoor container could pave the way to the construction of DC grids,” concludes Davidson. DC circuit breakers will be essential for the development of DC grids; however, the technology is in an intermediate state where the concepts have been proven up to mid TRLs but remain relatively large and potentially uneconomical. There is possible effective engineering, but full-scale product development is difficult to justify because of the limited commercial outputs. A gas-discharge tube-based hybrid DC breaker could potentially result in step-change as a more economically viable proposition with significant footprint and volume reduction compared what has been proposed so far.